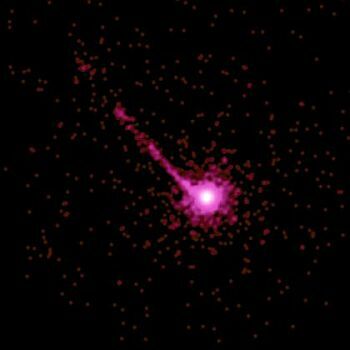 Quasars are manifestations of active galactic nuclei and the name derives from "quasi-stellar radio source". This was because, when they were first discovered, their high luminosity made them resemble stars. They can also be called "quasi-stellar objects", or QSOs. Here we see an X-ray image, taken by the Chandra radio telescope, of quasar PKS 1127-145, some 10 billion light years from Earth. The jet emanating from it is more than a million light years long. The properties that distinguish these phenomena are their very high luminosity - possibly as much as 100 times that of the whole Milky Way - and the fact that they are extremely distant objects, meaning that they are also very ancient. These characteristics, as it turns out, are very important, for reasons we'll consider further down the page. The whole thing started in the 1960s, with the first few being observed as radio sources rather than visible objects. After further study of one of the first quasi-stellar objects, 3C 48, it was finally found to have a faint blue star at its centre. Astronomers were then able to measure its spectrum. The results puzzled the scientists, as it contained emission lines that were, at the time, unknown. One thing it seemed to indicate was a very large redshift, but most astronomers refused to accept that possibility. Then, in 1962 another quasar, 3C 275, had its spectrum measured with greater accuracy and showed exactly the same emission lines. These lines were studied in detail by Dutch astronomer Maarten Schmidt and he concluded that these lines were actually of hydrogen with considerable redshift. As redshift is in direct proportion to the speed at which an object is receding from us, it was calculated as travelling at 30,000 miles per second! When the same calculations were applied to 3C 48, mentioned above, its velocity worked out at a staggering 69,000,000 miles per second - a large fraction of the speed of light. Next came the debate over whether these objects were actually extremely distant, as their large redshift implied. For them to be nearby objects, the redshift would have to be caused by a huge gravitational field, rather than velocity. For a star to have the amount of mass to generate such a field would be physically impossible - it would be completely unstable. The other option was also argued against, but, by the 1970s, advances in astrophysics showed that it was possible, so that's the prevailing theory today. 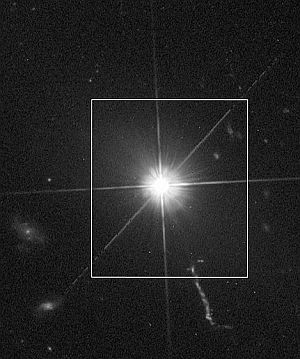 The 1980s finally saw quasars classed as active galactic nuclei and the only thing that distinguishes them from other AGNs is the angle we can view them at. And here is an image of the same object taken by Hubble's Advanced Camera for Surveys (ACS) which has managed to block out the bright star-like centre, to reveal the surrounding galaxy. This observable celestial phenomenon was predicted as the result of Einstein's Theory of Relativity, which implied that light itself could be bent by gravity. It is thought that it plays a part in the existence of "multiple quasars". In 1979, what appeared to be a double quasar was observed, named Q0957+561. At the time, gravitational lensing was only one of several possible explanations for the objects. 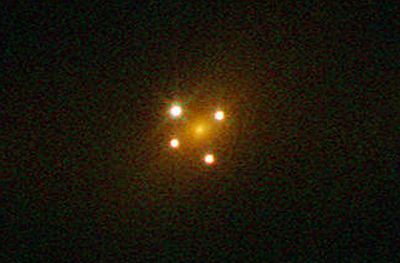 However, in 2007, a triple object was observed. Due to the rarity of QSOs, it was thought unlikely that this was a collection of three separate objects, but were, in fact, images of the same one and light from it had been bent by some other massive object in between the QSO and us. Here we see quite a famous image, called colloquially the "Einstein Cross". 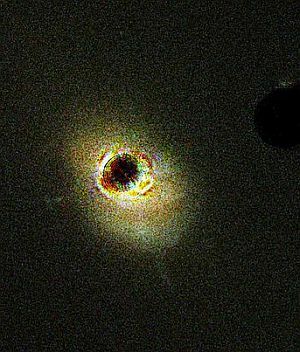 It shows a massive central galaxy, about 10 million light years distant, surrounded by four images of the same QSO, which is about 11 billion light years away. Due to their extreme distance, coupled with the fact that they are exceptionally bright objects and seemingly all at fixed points in the sky, QSOs are used as a basis for something called the International Celestial Reference System (ICRS). This is a system of mapping the Universe used by the International Astronomical Union. Using the combined centre of gravity of the whole Solar System as the central point, fixed axes radiate off into space and, at their other end, there's usually a QSO, as they are seen as the best candidates for the job. These imaginary axes can be thought of as similar to the lines of latitude and longitude on Earth. Another important property of QSOs is that their high energy emissions cause nearby older, faint galaxies to glow, thus enabling astronomers to observe what would otherwise be invisible objects. This has produced great strides in the understanding of the early stages of galaxy formation.